Thankfully we’ve evolved as humans from knuckle dragging cavemen to civilized beings with integrity and sophistication and it’s nice to say that our homes have followed suit. Let’s take the kitchen design for example, we’ve seen this household necessity evolve from a quaint little room to a full functioning and high tech space. The year the kitchen truly became a part of the home. 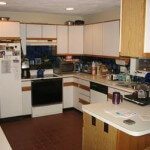 It’s inventor Dr. Buckminster Fuller brought a kitchen from a dark, dreary, work space next to the home, into an open space inside of the home. He brought his exhibit to the World’s Fair showcasing the new improved kitchen. Susie Homemaker put the kitchen on the map. During the golden age of consumerism, and post-war boom, she was pictured in her sparkling, bright, tidy kitchen tending to her husband and children. She could whip up a meal in no time using her new retractable oven and easily clean the dishes with her household dishwasher. 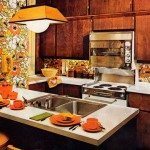 Flower power took over the kitchen of the 60s, influencing lime green and orange hues, floral patterned wallpaper and linoleum floors. 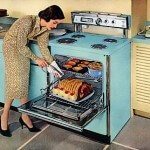 But what made the 1960s kitchen so great was the introduction of modern cabinetry and electric appliances, like the stove range and eye level ovens. 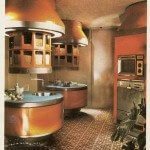 The kitchens of the 1970s got as groovy as the decade. 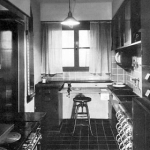 Kitchens were being designed with curved features, beveled edges and circular countertops. 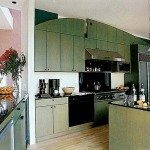 Appliances and cabinetry was appearing in a wide range of colors, fitting a theme within the kitchen space and household. Bar tops and stools were becoming the partition between kitchen and living room and providing a necessary area for entertaining. The 1980s created a population thriving on convenience. Where microwaved meals were all the rage. Kitchens were making an emphasis on counter space as this was the new room for children to do homework or dine while watching TV. Butcher blocks, tile, and dare we say gold speckled formica counter tops and white cabinetry were prevalent in the 80s homes. The 90s brought a lot to the table, the kitchen table that is, islands were appearing in kitchens everywhere doubling as a hostess stand and cook/prep station. The kitchen was growing as the focal point of the home bring sturdy materials and construction into this space and giving each household it’s own unique identity with a variety of design styles. The kitchen hasn’t stopped evolving and has become even more efficient.In its efforts to go green, more kitchens of the new millennium are homes to energy efficient appliances and solar panel operated items. Multi-functionality it’s not only convenient it’s a necessity. More gadgets are serving multiple purposes as are materials used within the kitchen design. Technology is making an appearance to make our lives easier. If you’re looking for kitchen design in San Francisco contact our creative team at Domicile! 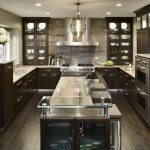 We can give you a full kitchen remodel with the look of the past, present, and future!